The summertime is built for plenty of events in the community such as BBQ’s, cookouts, parties and even basketball tournaments. In the City of Brotherly Love, there’s plenty of that going on, including the latter. At Cherashore Playground. located on 10th & Olney in North Philadelphia, it is home to one of the best tournaments in America, the Chosen League, which is in its 14th year of existence. Every year, the Chosen League has an event to kickoff their season called the Chosen Game, a battle between the high school seniors that are headed off to college and the underclassmen (freshmen, sophomores and juniors). In this event, there was plenty of the best talent in Philadelphia that you will see on ESPN in the future. On the senior side, there were players such as Levan Alston (Haverford School/Temple), Lamarr Kimble (Neumann-Goretti/St. Joseph’s), Derrick Jones (Archbishop Carroll/UNLV), Kimar Williams (Constitution/Florida International), Mike Watkins (Phelps School/Penn State and Moustapha Traore (Phelps School/Monmouth). The underclassmen countered with players such as Lamar Stevens (Roman Catholic/Class of 2016), Tony Carr (Roman Catholic, Class of 2016), David Beatty (Archbishop Carroll/Class of 2017), Nysier Brooks (Life Center Academy/Class of 2016), Stevie Jordan (Conwell-Egan Catholic/Class of 2016) and Penn State verbal commit Nazeer Bostick (Roman Catholic/Class of 2016). The first half of the game was like a freestyle rap battle, competitive. Every player brought their A-game and none of the players backed down from their opponent. Halftime ended with the Underclassmen leading 56-53. The second half brought more of the same as there were plenty of dunks, crossovers and three-pointers from both sides. The second half ended with a tie that ended up bringing the game to overtime. In the end, the seniors capitalized on the opportunity of an extra session and brought home the victory with a 113-106 victory. The Chosen Game featured players that are or have been highly-touted players throughout the country. The talent that was on display throughout the evening showed that the future is bright for players from Philadelphia. Many of the city’s top players that have made it to the college ranks and to the NBA have come through this very tournament. As tournament founder Rahim Thompson says, playing in the Chosen League is like a rite of passage. Not just any player gets to play in this tournament. You must be chosen to compete in the grandest of stages. You must always come ready for battle and never back down from a challenge. 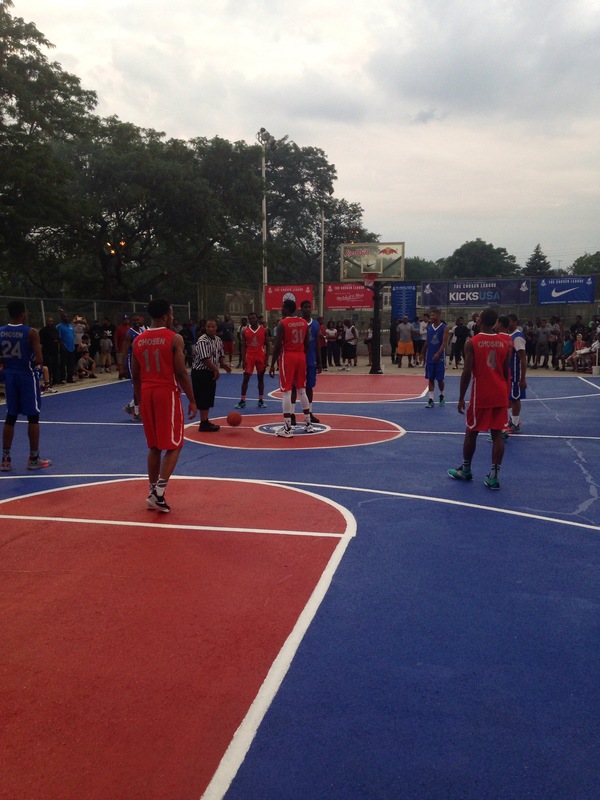 Welcome to 10th & Olney, the battleground of youth basketball in the City of Brotherly Love. Nazeer Bostick, Roman Catholic, Class of 2016 – Bostick is an explosive guard that has good ball handling skills, plays above the rim and rebounds efficiently. He is also fearless when going to the basket. He has a verbal commitment to Penn State. Moustapha Traore, Phelps School, Class of 2015 – Traore is a forward that can do plenty of damage in the paint as far as rebounding and scoring points. He has a solid skill set and is very mobile around the basket. He will be headed to Monmouth University in the fall. Samir Doughty, Math, Civics and Sciences, Class of 2015 – Doughty is a very athletic guard and is also a scoring machine. He can get to the basket in many ways is a good shooter. He will be headed to VCU in the fall. Lamar Stevens, Roman Catholic, Class of 2016 – Stevens is a bruising forward that can bully his way into the basket. He gets rebounds and put backs with precision. He holds offers fro SMU, Memphis, Xavier, Maryland, Georgia Tech, Iowa, Florida State, Pittsburgh, Virginia Tech, Marquette, Rhode Island, Villanova, East Carolina, Temple, Penn State, St. Joseph’s, Indiana and Creighton. Lamarr Kimble, Neumann-Goretti, Class of 2015 – Kimble is a pure point guard that can make superb passes and can score baskets when needed to. His best asset is finding teammates for baskets. He will be headed to St. Joseph’s in the fall. Derrick Jones, Archbishop Carroll, Class of 2015 – Jones is a forward for walking human-highlight reel. He can fly to the basket at will and is fearless when going to the lane. He will be headed to UNLV in the fall. Nysier Brooks, Life Center Academy, Class of 2016 – Brooks is a forward with a skill set. He is a good rebounder and is very mobile around the paint. He also finishes strong at the rim. He holds offers from St. Joseph’s, Miami, Rhode Island, Cincinnati, Georgetown, Fordham, South Carolina, Seton Hall, LaSalle and Virginia Tech. Kimar Williams, Constitution, Class of 2015 – Williams is a guard that has good ball handling skills and can take it to the basket with precision. He will be headed to Florida International in the fall. Stevie Jordan, Conwell-Egan Catholic, Class of 2016 – Jordan is a guard that can score and can find multiple ways to get to the basket. He holds offers from Richmond, Hampton, Rider and Towson. Levan Alston, Harverford School, Class of 2015 – Alston is a playmaking guard that can score as well as find teammates for baskets. He is also an efficient shooter. He will be headed to Temple in the fall. David Beatty, Archbishop Carroll, Class of 2017 – Beatty is a guard that is a good ball handler. He can be very athletic and is aggressive when going to the rim. He holds offers from Miami, St. Joseph’s, Penn State and Siena. Tony Carr, Roman Catholic, Class of 2016 – Carr is an offensive dynamo. He is a scorer that can light up the court with ease and score in bunches. He holds offers from Memphis, Miami, DePaul, Xavier, Indiana, Georgetown, Florida State, Iowa, Pittsburgh, Virginia Tech, VCU, Providence, Stanford, SMU, Illinois, Arizona State, St. John’s, Wichita State, Rhode Island, Temple, Maryland, LaSalle, Penn State and Cincinnati.